Gigantic Iron Mass Transfer In The Early History Of The Earth/Mars: Ferrous Iron Borate Aqueous Complex As A Key Player In Primitive Earth/Mars Oceans? Iron is the fourth-most-abundant element in the Earth’s crust. 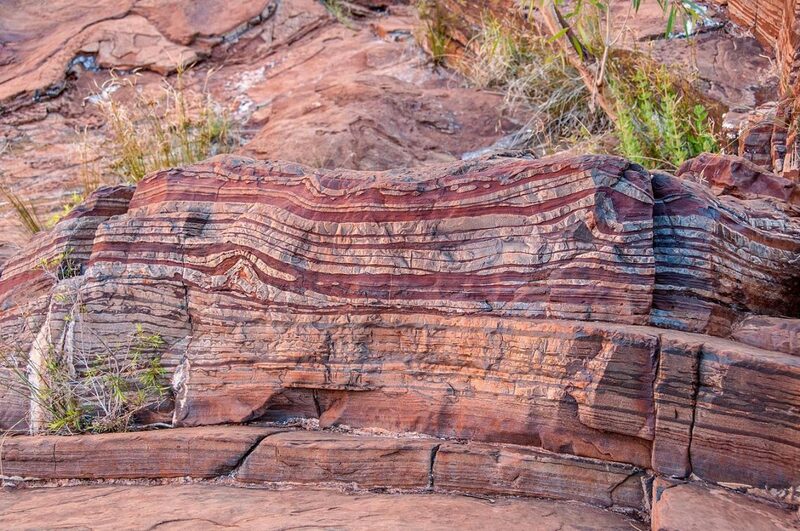 There were massive movements of iron in primitive oceans in the early history of our Earth, resulting in the formation of impressive iron deposits called Banded Iron Formations (BIF) in geology. Our current civilization is largely built on the utilization of such iron deposits. In the early Earth’s atmosphere, the partial pressure of oxygen, PO2, was lower than 10–4 atm. Under such reducing conditions, dissolved iron was present as ferrous iron in the primitive oceans. However, researchers have long been intrigued by what plays a role in massive transport of iron in primitive oceans. 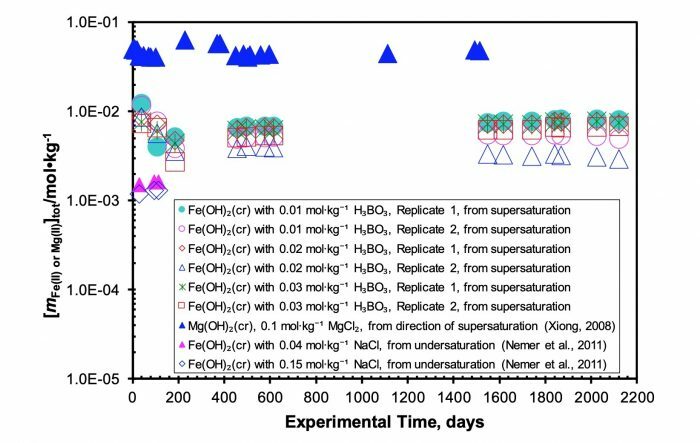 The plausible answer may be that aqueous ferrous iron borate complex, FeB(OH)4+, may have played an important role in massive transport of iron in the early history of the Earth. is determined as 3.70 ± 0.10 (2σ) at 25oC. At higher temperatures, the strength of this aqueous complex is expected to become stronger, meaning that the formation constant will be higher and, therefore, more Fe(II) will be complexed as FeB(OH)4+. Under the pH conditions of the primitive oceans that was close to neutral, but slightly alkaline, FeB(OH)4+ may have been important in transport of iron at the surface of the primitive Earth, as borate is expected to be present in the primitive oceans at significant concentrations to have formed evaporitic borate precursors (e.g., Grew et al., 2011). 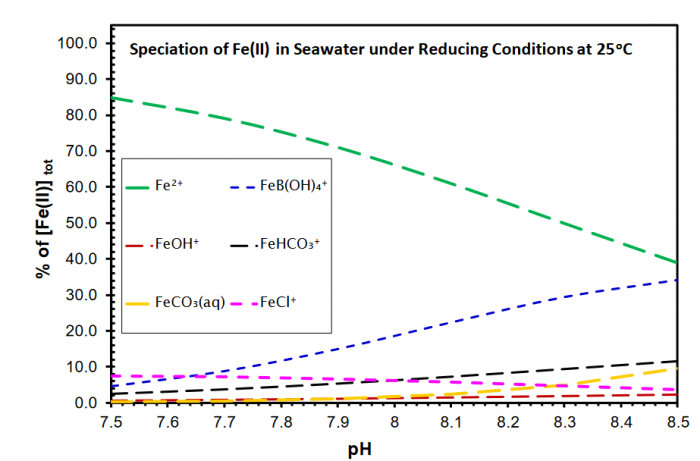 Figure 1 illustrates the speciation of Fe(II) as a function of pH at 25oC from near-neutral to slightly alkaline pH. Figure 1 demonstrates that FeB(OH)4+ is the dominant species besides Fe2+. Other species such as FeCl+, FeOH+, FeHCO3+, and FeCO3(aq) cannot compete with FeB(OH)4+. Notice that the above calculations are performed at 25oC. As the surface temperatures for the early history of the Earth were estimated to have been 70 ± 15oC (Knauth and Lowe, 2003), and as borate concentrations in the primitive oceans may have been higher, the strength of FeB(OH)4+ is expected to have been much stronger at slightly alkaline pH in the primitive oceans. The strong dependence of FeB(OH)4+ on pH also provides a viable mechanism for deposition of iron in the early history of the Earth. It is likely that iron was transported out of the region with a slightly alkaline pH. When iron reached the region with near-neutral pH, the iron transported as FeB(OH)4+ was deposited, because FeB(OH)4+ becomes a weaker species in near-neutral pH, resulting in supersaturation with respect to the iron phase. It has been recently reported that there are evaporate formations containing high concentrations of borate on Mars (Gasda et al., 2017). We can infer that FeB(OH)4+ could have played a similar role in the massive iron mass transfer in the early history of Mars. In the field of nuclear waste management, FeB(OH)4+ is also expected to play a role. First of all, borate can form aqueous complexes with Nd(III) (Borkowski et al., 2010), analogs for actinides in the +III oxidation state, such as Am(III). If borate is to form an aqueous complex with Am(III) in a geological repository, complexation with borate would contribute to the mobility of Am(III). Complexation of Am(III) with borate would also increase the solubility of Am(III). In geological repositories for disposal of nuclear waste, iron is present in repositories as waste containers and waste, and borate concentrations from the geological formations and degradation of borosilicate waste forms for high-level nuclear waste (HLW) can be significant. Therefore, the formation of FeB(OH)4+ could reduce the amounts of soluble borate that are available for complexation with Am(III). However, the presence of borate could also enhance the corrosion of iron-based containers. Sandia National Laboratories is a multi-mission laboratory operated by National Technology and Engineering Solutions of Sandia, LLC., a wholly owned subsidiary of Honeywell International, Inc., for the U.S. Department of Energy’s National Nuclear Security Administration under contract DE-NA-0003525. SAND2019-2424 W.
These findings are described in the article entitled Experimental determination of stability constant of ferrous iron borate complex [FeB(OH)4+] at 25 °C from solubility measurements: Implications for transport of iron in reducing environments, recently published in the journal Chemical Geology. Borkowski, M., Richmann, M., Reed, D.T. and Xiong, Y., 2010. Complexation of Nd (III) with tetraborate ion and its effect on actinide (III) solubility in WIPP brine. Radiochimica Acta International journal for chemical aspects of nuclear science and technology, 98(9-11), pp.577-582. Gasda, P.J., Haldeman, E.B., Wiens, R.C., Rapin, W., Bristow, T.F., Bridges, J.C., Schwenzer, S.P., Clark, B., Herkenhoff, K., Frydenvang, J. and Lanza, N.L., 2017. In situ detection of boron by ChemCam on Mars. Geophysical Research Letters, 44(17), pp.8739-8748. Grew, E.S., Bada, J.L. and Hazen, R.M., 2011. Borate minerals and origin of the RNA world. Origins of Life and Evolution of Biospheres, 41(4), pp.307-316. Knauth, L.P., Lowe, D.R., 2003. High Archean climatic temperature inferred from oxygen isotope geochemistry of cherts in the 3.5 Ga Swaziland Supergroup, South Africa. Geol Soc Am Bull 115:566–580. Nordstrom, D.K., et al., 1979, A comparison of computerized chemical models for equilibrium calculations in aqueous systems, in Jenne, E.A., editor, Chemical Modeling in Aqueous Systems, ACS Symposium Series, v. 93, American Chemical Society, Washington, DC, p. 857-892. Xiong, Y., Kirkes, L., Knox, J., Marrs, C. and Burton, H., 2018. 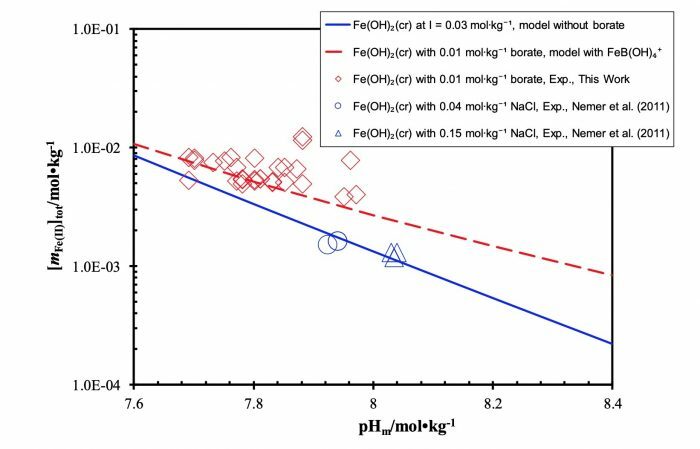 Experimental determination of stability constant of ferrous iron borate complex [FeB(OH)4+] at 25° C from solubility measurements: Implications for transport of iron in reducing environments. Chemical Geology, 493, pp.16-23. Yongliang Xiong is a research scientist at Sandia National Laboratories.